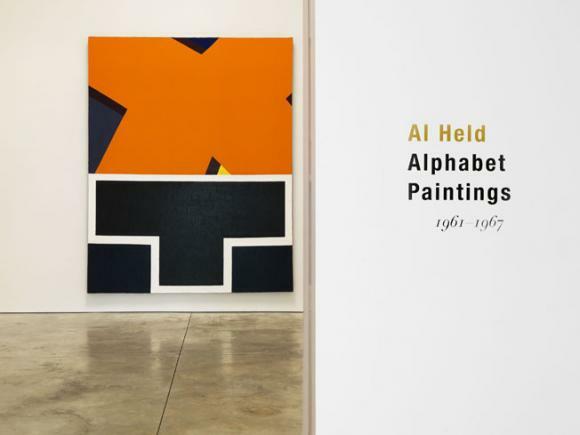 Cheim & Read is pleased to announce an exhibition of seven monumental paintings, dating from 1961–67, by New York painter Al Held (1928–2005). Curated from several private collections, the show presents a unique opportunity to see first-hand the geometric, “hard-edge” works that defined Held’s artistic output for almost a decade. The exhibition is accompanied by a full-color catalogue (including 20 illustrated works) featuring an essay by Robert Storr. Several paintings enlarge and abstract letters from the alphabet, and are titled as such: “The Big ‘D’”; “The Big ‘N’”; “The Yellow X.” Importantly, Held did not use letters to reference literary or historical subject matter; he related to them as geometric, clear, and “acceptable” formal devices with which he could “make something very concrete.” While specificity and clarity is paramount, subtle distortion is also at work, disrupting immediate readings of the figure-ground relationship. Carefully-chosen colors add weight, tension, and structure, supporting the painting’s formal cohesion. The saturated planes of “The Yellow X” (1965) seem to simultaneously lean out towards the viewer and contract inward and away, a sensation similarly achieved in “Ivan the Terrible” (1961). Slight angles on the capitals of “The ‘I’” (1965) almost imperceptibly swell its middle, as if it were breathing into the viewer’s space; densely-stacked, bulbous circles push against the edges of “Echo” (1966), optically distending the painting’s frame. Angled passages through “Siegfried,” “Thalocropolis,” and “Acracropolis” (all 1966) segment the picture-plane horizontally and vertically, carving hierarchies of space and subverting implied symmetry. Held’s paintings demonstrate a thorough and thoughtful experimentation. Ultimately, he questions the nature of space, form, and perception not only in painting but in the phenomenological understanding of our own dimensional existence. A panel discussion on the subject of Al Held’s work will take place March 6 at 6:30.